Not this… | Listen. Reflect. Explore. Solve. After a pause I am working again on my semi-automated podcast transcription project. The first part involves evaluating the quality of various methods of transcription. But how? In this post I’ll explore how I’ve been comparing transcripts to evaluate transcription services. I’ll include the results for some human-powered services. I’ll write up the results for automated services in a later post. The medium of podcasting continues to grow in popularity. Americans, for example, now listen to over 21 million hours of podcasts per day. Few of those podcasts have transcripts available, so the content isn’t discoverable, searchable, linkable, reusable. It’s lost. The typical solution is to pay a commercial transcription service, which charge roughly $1/minute and claim around 98% accuracy. For a podcast producing an hour of content a week, that would add an overhead of around $250 a month. A back catalogue of a year of podcasts would cost over $3,100 to transcribe. When I remember fragments of some story or idea that I recall hearing on a podcast, I’d like to be able to find it again. Without searchable transcripts I can’t. It’s impractical to listen to hundreds of old episodes, so the content is effectively lost. Given the advances in automated speech recognition in recent years, I began to wonder if some kind of automated transcription system would be practical. This led on to some thinking about interesting user interfaces. This (long) post is a record of my research and ponderings around this topic. I sketch out some goals, constraints, and a rough outline of what I’m thinking of, along with links to many tools, projects, and references to information that might help. I’ve also been updating it as I’ve come across extra information and new services. For some time now Jens Rehsack (‎Sno‎), H.Merijn Brand (‎Tux‎) and I have been working on bootstrapping a large project to provide a common test suite for the DBI that can be reused by drivers to test their conformance to the DBI specification. This post isn’t about that. This post is about two spin-off modules that might seem unrelated: Data::Tumbler and Test::WriteVariants, and the Perl QA Hackathon that saw them released. At the heart of one of our major web applications at TigerLead is a property listing search. The search supports all the obvious criteria, like price range and bedrooms, more complex ones like school districts, plus a “full-text” search field. As soon as I saw a Flame Graph visualization I knew it would make a great addition to NYTProf. 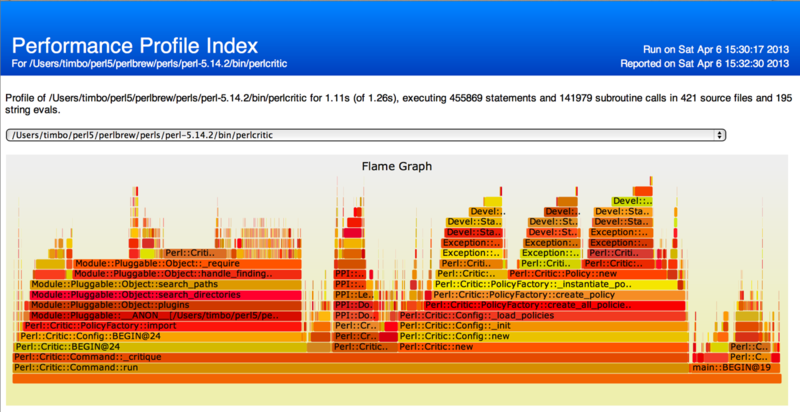 So I’m delighted that the new Devel::NYTProf version 5.00, just released, has a Flame Graph as the main feature of the index page.